Trying to accurately sum up everything that happened over two epic nights fo football is not going to be an easy task. 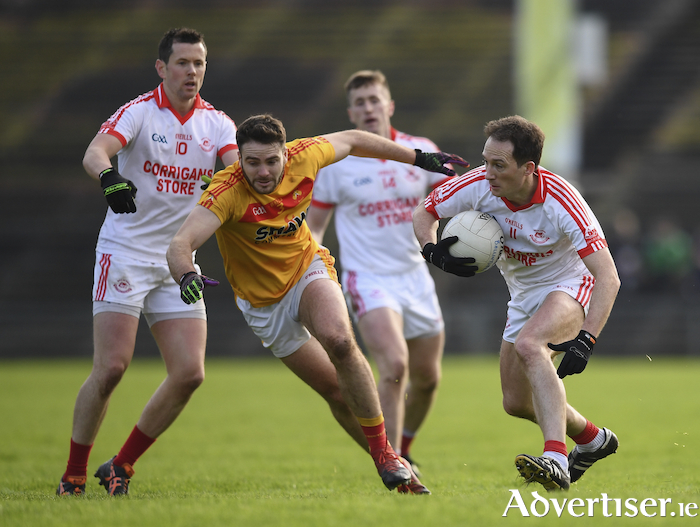 The short version is that Ballintubber saw off their old foes Castlebar Mitchels by a single point at the end more than 160 minutes of football, but there is so much more to this tale that just that simple reading. After their dramatic come from behind saving of their first meeting the week before, many thought that Ballintubber’s chance had gone, going into this one. Mitchels certainly looked like a different team inside the opening two minutes of the game with Shane Hopkins and Neil Douglas kicking early points to get the defending champions off and running. Cillian O’Connor slotted over a free from 45m out to get his side moving four minutes in, both he and Steven O’Malley dropped shots short before the Mayo captain levelled it up on 11 minutes after Brian Walsh had been fouled. Walsh had excelled the previous week picking up Paddy Durcan and curbing his influence on the game for the Mitchels. One minute later Ballintubber edged their noses in front thanks to a Gary Loftus effort that looped over the bar and not long after Jason Gibbons charged through from the middle exchanged a one-two with Cillian O’Connor before hammering the ball over the bar to put Ballintubber 0-4 to 0-2 clear. Mitchels sprung back into live and James Durcan slotted over two fine points within 60 seconds of each other, both times he showed a clan pair of heels to his marker before finding the target. Ten minutes before the break the county town men went back in front when David Stenson kicked his first score of the day from a free after Neil Douglas was fouled, the Mitchels full forward was a constant threat all day and put in a brilliant showing, despite ending up on the losing side. Ballintubber had the better of the last third of the half and reeled off three unanswered points with Cillian O’Connonr, Walsh and Alan Dillon all raising the white flag to send their side in leading 0-7 to 0-5 at the short whistle. Barry Moran had the gap back to just a single point not long after the resumption - O’Connor responded from another free before five minutes had elapsed. Douglas and Steven O’Malley then swapped points to leave the Tubber 0-9 to 0-7 up just before the three quarter mark. Two quick points from sub Anthony O’Boyle and Douglas tied the game up again before the 20 minute mark at nine points each. Mitchels edged in front through a good Paddy Durcan score and that was stretched out to two points after Shane Hopkins found some space to slip it over the bar. Cillian O’Connor cut the gap back to one from another placed ball six minutes from the end of normal time, but two minutes later Hopkins was fouled within shooting range and Stenson put two between the teams once again and it was looking like the champions would hold on. Cillian O’Connor had two attempts from 45s that dropped short, with one being put out for a second 45 and his resulting effort from that one forcing Rory Byrne into a fantastic save from an Alan Dillon flick. As the game edged into injury time Diarmuid O’Connor stepped up and hammered over a long ranger to leave just the minimum between the teams, with three minutes of injury time singled by the fourth official it was going to be a nail biting ending. Ballintubber managed to work the ball to Jamsie Finnerty in the left corner of the field, the tricky corner forward tempted Donie Newcombe into a tackle that ended up with a free in being awarded. It was by no means an easy score, but Cillian O’Connor held his nerve and split the posts sending the game into a second bout of extra time. Both Cillian and Diarmuid O’Connor kicked the first two scores of the additional period, with Diarmuid’s score coming after he stood up Paddy Durcan, before burning him for pace to get in behind him and slot it over the bar. David Stenson responded with a free just before the short whistle to leave just one between he teams as we headed into the final ten minutes. Stenson had what looked like a simple chance to level it up from a close range free just after the restart but he pulled his effort wide of the target. Padraig O’Connor pushed Ballintubber two clear once again at the midway point of the half, but Mitchels weren’t done yet and Douglas pointed a free a minute later and with less than a minute to go - Cillian O’Connor was pinged by the referee for an off the ball pull and following protestation from the Ballintubber defence the ball was brought in closer to goal and Douglas levelled it up - again. It was all to play for for both sides, Ballintubber won the ball back and patiently held on to the ball with Jason Gibbons, Alan Dillon and Cillian O’Connor all getting on the ball before it was worked to sub Joe Geraghty who had just come on a few minutes earlier. The chance looked simple, but with the pressure that was on him - it was no easy chance, but the Ballintubber number 19 held his nerve and drove it over Rory Byrne’s bar and his team back into the final.